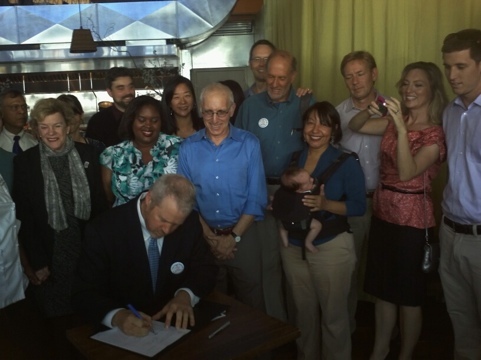 ← Join us to watch – and celebrate – as paid sick days become law in Seattle! Seattle Mayor Mike McGinn signed landmark city legislation into law today, ensuring that hundreds of thousands of people working in Seattle will be able to earn paid sick days on the job. When the new law takes effect next September, an estimated 150,000 workers who previously did not earn paid sick days will start to accrue them; thousands more workers will be able earn additional paid sick days and have additional flexibility for using them. Over 100 local organizations and small businesses endorsed the paid sick days proposal, and thousands of Seattle workers called, emailed and turned out in support – a groundswell of support that eventually led to passage by the City Council on September 12th by an 8-1 vote. The coalition applauded Council members Nick Licata and Tim Burgess in particular for their leadership in forging consensus among their colleagues for a strong ordinance that will protect workers, safeguard public health and support healthy businesses. The bill signing took place at Plum Bistro Restaurant, owned by Makini Howell, one of the first small business owners to support the proposed ordinance. “Over the last year, I joined with a group of small business owners to work alongside with public health professionals, labor unions, community groups, and elected leaders to craft this law. By collaborating and working together, we produced a law that protects the health of our customers, increases the economic security of employees, provides flexibility for small businesses, and strengthens the economy,” said Howell. Seattle joins San Francisco, Washington, D.C., and the state of Connecticut in establishing a minimum paid sick days standard. Voters in Denver will consider a paid sick days ballot measure this November, and active campaigns are underway in other cities and states. More than 75 organizations comprise the Seattle Coalition for a Healthy Workforce, whose leadership includes Economic Opportunity Institute, MomsRising, Puget Sound Sage, UFCW 21, Legal Voice, Washington CAN, Puget Sound Association for Retired Americans, M.L. King County Labor Council, and the Washington State Labor Council. This entry was posted in Business productivity, Healthy workers, In the news, Paid sick days and tagged City council, Mike McGinn, nick licata, seattle, seattle city council, Sick leave. Bookmark the permalink.